Every fighter is from someplace. For Max Holloway, from the rugged west side of Oahu, it's different. I don’t need two hands’ worth of fingers to count the number of times I trekked from my home on the lush, rainy windward side of Oahu out to the dry west side of the island. It’s not because it is a long journey, certainly not by typical mainland standards. It’s just that there was never much of a reason to go out there. The west side has a bleak image, and a reality to back it up—it’s the epicenter of the statewide crystal meth epidemic, with all the trouble that follows. To think of the leeward coast as anything but the other side of the island—let alone as a font of local talent—is to see it as most people just...don’t. As usual, there is more to the story than a reputation and dire statistics would suggest. The leeward side of Oahu has its struggles, but struggle can produce a fighter like Max “Blessed” Holloway. For residents of Hawaii, however, Holloway has been a household name and hometown hero for his state since his first UFC fight. As a teenager, Holloway quickly ascended the ranks of the local X-1 promotion, ultimately winning its lightweight championship before he could legally order a beer. He needed only one more fight, and a career total of four professional bouts, before making his Octagon debut in 2012. By that time, Hawaii's most prominent fighter was already a shell of his former glory, winless in two years, and one foot in retirement. Someone would take B.J. Penn’s place, but Max Holloway didn’t seem like a lock for the role. Hawaii-born fighters in professional MMA is nothing new; the very first UFC event featured Teila Tuli, a native of Honolulu, and to this day Hawaii has been the most represented state in terms of UFC fighters produced per capita. Several high-profile fighters that call Hawaii home—Kendall Grove, Brad Tavares, Travis Browne, and the aforementioned Penn—had already succeeded in cultivating a wide audience and, more importantly, achieving competitive success in the cage by the time Holloway first appeared in the promotion. In that light, Holloway's success is nothing more than another chapter in an established narrative. But his story is different. 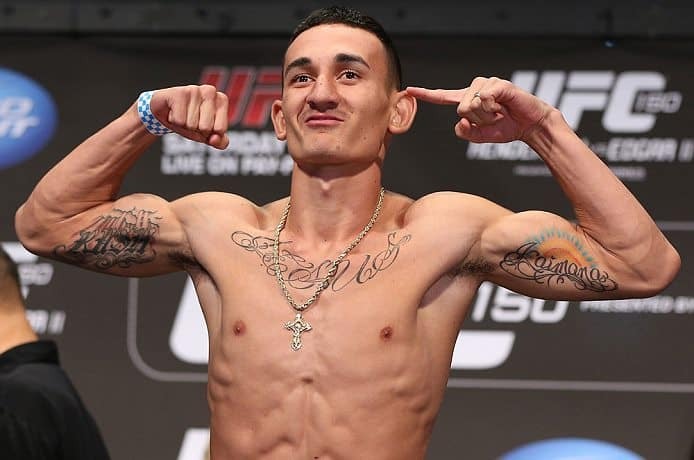 To this day, Max Holloway has trained exclusively in his hometown: Waianae, on the rugged west side of Oahu. Without exception, the Hawaii-born fighters who have succeeded in the UFC as Holloway has have all left the islands to train on the mainland. Kendall Grove moved to California after winning The Ultimate Fighter Season 3, Brad Tavares has since moved to Las Vegas, and Travis Browne launched his career out of New Mexico, and later California. Penn got his start at American Kickboxing Academy in California, returning to train at home only after he had established himself in the sport. Most fighters who stayed in Hawaii did not last long in the promotion, let alone become legitimate contenders. This seems like an obvious decision; Hawaii is too small to compete with what the mainland states can offer. To put it in perspective, Hawaii has something like 1.4 million residents, the tenth smallest population in the country; the roughly eight million tourists who visit its shores each year amounts to more than five times the people who actually live in the state. Though Holloway fights out of Hawaii Elite MMA, which boasts a handful of UFC fighters in its stable, it can hardly be considered a major training center. And yet it’s no coincidence that he has made it his home base. Holloway has, in several interviews and promos, stated what it means for himself and his community that he represents the islands. And while several other Hawaii-born fighters have done their state proud, Holloway’s choice to continue training at home resonates in a different way for Hawaii residents. The story of foreigner influxes to Hawaii throughout history is commonly known, but the reverse effect that relationship dynamic has had is less broadly discussed. When you grow up in Hawaii, no matter what you want to do, it is likely that you will be told that you’d be better served trying to do it on the mainland. The schools are better, there are more jobs, more opportunities, more everything. If you pit-stop at any university on the west coast, large or small, you will not need to search long before you find a campus Hawaii Club. Whether temporary or otherwise, the best and brightest of the 50th state are exported across the country consistently. Be it in academics or athletics, Hawaii’s finest are cherrypicked by the mainland powerhouses, and while their representation of Hawaii is always a source of pride for those of us back home, there is nothing quite as inspirational or empowering as seeing someone succeed and keep it local all at once. This is why Holloway matters, at least at home. Due to its size and location, Hawaii is and always will be an underdog, on both the national and international level. It is almost a prerequisite for BBQ conversations to know who is representing the islands on the big stages, in any facet of culture, and especially sports. The whole state has this mentality to at least some extent, reflexively supporting anyone who makes a name outside of the 808. Holloway is special not just because of his obvious athletic gifts, but also because he is aware of how important it is for the people of Hawaii to see someone succeed on the mainland, and do so without leaving home. He is living, walking proof that Hawaii can produce, maintain, and support its talent. For local kids, a demographic that is deeply meaningful to Holloway, he is perhaps the most prominent example of a local son who made it. And those same kids can still see him jogging around the roads of Waianae. When Marcus Mariota won the Heisman, he told the media that “if one person is successful, the entire state is successful.” Every time Holloway’s hand is raised, the roughly 1.4 million Hawaii residents are also raising theirs. It’s a show of excitement and support, but also a claim of vicarious success. When Holloway fights, we fight; when he wins, we win. Max Holloway represents Hawaii through his dynamism, creativity, style, and heart. But perhaps his most significant act of putting Hawaii on his back has been keeping his feet planted. At just 23 years of age, the “Blessed” one has nothing but time to develop into the champion that his home state hopes for. Every punch, knee, or cartwheel kick he throws will have the strength of a sea of people in the middle of the pacific behind it. It may or may not be enough to make him a champion; only time will tell, there. But it is already enough to make him a hero. I like a persons site. It is actually better than watch absolutely everyone explain in words around the life blood coupled with legibility during this matter vital vicinity are frequently suitably noticed. Your article has proven useful to me. It’s very informative and you are obviously very knowledgeable in this area. You have opened my eyes to varying views on this topic with interesting and solid content Free chat room community for anyone 13 years of age or older.